The news was not good. Without the credit card used to purchase my airline ticket online, I would not be able to get on the plane. But there was a workaround. I could buy a new ticket for $1000+. This was not really good news but I tried to stay calm. It didn’t work. There seemed to be a choice between two bad alternatives. If I didn’t get on the plane, the value of my original ticket was lost. That’s $900+ out the window. If I got on the plane, it would cost me $1000 on top of my original $900. Hmmm. The agent offered a glimmer of hope. He would accept the $1000 as a deposit. If I could somehow get my credit card to the Qatar Airways office in Bali, there might be away to get my money back for the second flight. I looked at my watch which now indicated 15 minutes to takeoff and decided to buy a new ticket. The agents sprang into action to run my credit card, get me the seats I wanted, pay my departure tax, and check my hiking poles. I asked if they were holding the plane for me and they said it wasn’t even boarding yet. Hmmm. I grabbed my boarding pass, said a few half-hearted thank you’s (why??) and bolted through the terminal. To my surprise, the boarding area was full and no one had boarded. I looked at my watch. 15 minutes after takeoff time. Then I looked at the airport clock. 45 minutes until takeoff. It was then I realized my second bone-headed move. My watch was set on Bali time, which is one hour later than Jakarta time. I had an hour more than I thought. I don’t think it made any difference in the outcome, it only cost me a few more anxious moments. I got on the plane and we took off a little after midnight. The day was already eighteen hours long. Since then things have gone pretty smoothly. I arrived in beautiful downtown Doha at 4 am local time. About 90 degrees and HUMID. Isn’t this supposed to be a desert? World’s longest bus ride between the plane and the terminal. I swear it was at least 30 minutes long. It was like a tour of all the wonderful airport facilities. And on your left is the toilet servicing area. Right next to the catering kitchens. Here’s the cargo area and here’s where my cousin works in airport security. I think I’ll stop and say hello. Finally we reach the transfer terminal and get blasted by the a/c. Did you you can buy a Bentley GT at the duty free shop in Doha? I wonder if they still have the guy hand it to you as you get on the plane. Mr. Schlesinger, here’s your carton of cigarettes, fifth of Seagram’s and Bentley GT. Wait till the guys in economy see this! But I digress. Oh, one more thing. I know airport food is expensive but should a double latte really cost $6+? I should have priced the Bentley. So now it’s 6:30 am local time and back to the tour bus. Since it was dark when we landed, let’s drive by all the wonderful airport facilities in the daylight to appreciate all their magnificence. My cousin has finished his shift but I think my brother-in-law just punched in at baggage handling. 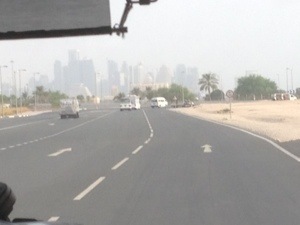 Actually, it was cool to see downtown Doha which looks exactly like you would expect a UAE capital to look like. LOTS of high-rises in white undulating shapes. The flight left about an hour late because we were waiting for a few late transfers. Or maybe they had trouble loading the Bentley in the overhead.